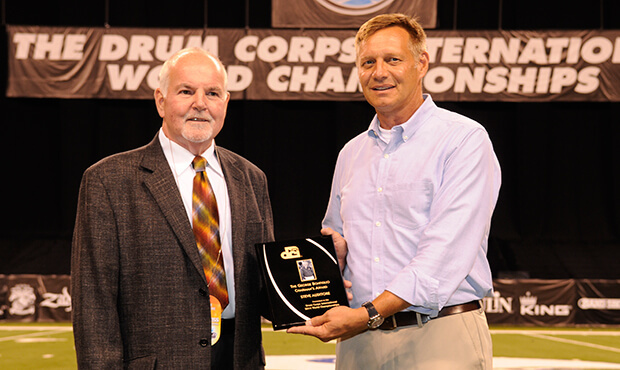 David Glasgow (L) is presented the Dr. Bernard Baggs Leadership Award by DCI Executive Director Dan Acheson. 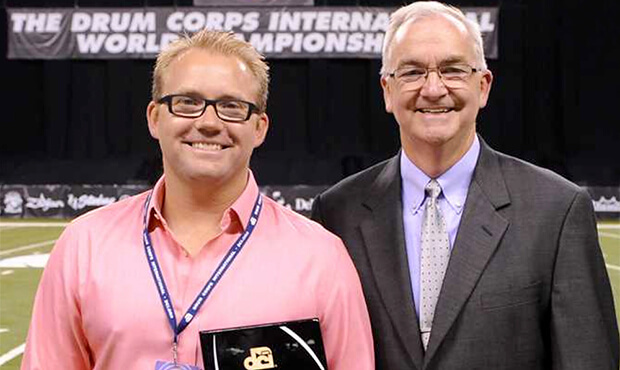 David Glasgow, executive director of the Bluecoats and Tim Rall, director of 7th Regiment received recognition as Drum Corps International Directors of the Year in their respective classes during the 2014 DCI World Championships. Glasgow is the recipient of the Dr. Bernard Baggs Leadership Award, named after the longtime judge and DCI Board of Directors advisor who passed away in 1998. The award recognizes the World Class Director of the Year and is decided upon by a vote of corps directors. 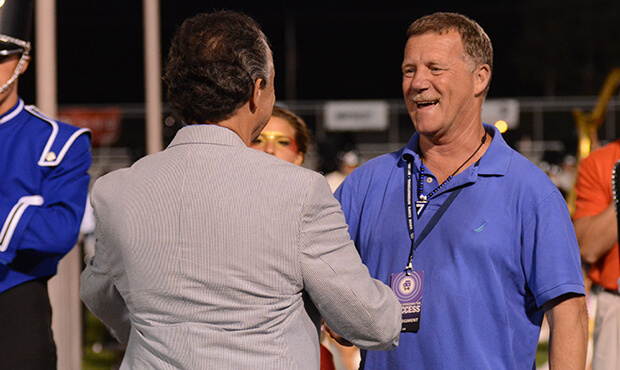 Appointed to the position just a few years after he served as drum major of the Bluecoats, Glasgow has been executive director of the Ohio corps since 2004. Humbled by the award which was presented as part of the opening ceremonies of the DCI World Championship Finals on August 9, Glasgow says that being recognized with this accolade is more a reflection on his entire organization than on him personally. "From our design team to our staff, the board of directors and the members themselves, everyone has been firing on all cylinders this summer, and I think it's really a recognition of their hard work. That's what I'm most proud of," Glasgow said. Glasgow is recognized during a year in which his corps had its best finish ever. Taking second place at the DCI World Championship Finals, the Bluecoats have never placed or scored higher in the organization's more than 40-year history. 2014 was just the second year that the Bluecoats finished among the top three at the DCI World Championships after taking the bronze in 2010. "We've had a great year," Glasgow said. "We strive to have a show that will get people out of their chairs every single night. I think we've done that, and it's helped propel us this year." This is the second time in eight years that Glasgow has been honored with the Baggs Award. He previously received the honor in 2006. Tim Rall (R) is congratulated during the Open Class World Championship Finals on Aug. 5 in Michigan City, Ind. Corps directors selected 7th Regiment's Tim Rall as the 2014 Open Class Director of the Year. Stepping into a management position in 2007 with 7th Regiment as an assistant director, Rall assumed the directorship two years later in 2009. Under Rall's leadership, 7th Regiment advanced to the Open Class World Championship Finals for the first time in 2009, and the corps has been on the rise ever since. "I have a great team of staff and support staff behind me," Rall said. "We try to keep building each year after year, growing in numbers and improving our shows. We continually have a great group of kids." In 2014, 7th Regiment had its best finish ever, placing fifth at the Open Class World Championship Finals in Michigan City, Indiana. Two days later in Indianapolis, the group scored well enough to advance to the Semifinals at Lucas Oil Stadium for the first time in the corps' history. Steve Auditore (L) is presented the Bonfiglio Award by DCI Board of Directors Chairman Jeff Fiedler.